The Metro staff recommendations for a locally preferred alternative (LPA) for the Regional Connector have also been posted online today. Unlike the subway project, Metro staff had already recommended building the fully underground option as part of the project’s draft environmental impact statement/report (DEIS/R). There is one bit of news, however: Metro staff have now recommended eliminating a proposed station at 5th/Flower as a way to reduce the overall cost of the project. The Regional Connector would still have three stations: Little Tokyo, 2nd/Broadway and Fourth/Hope. The 5th/Flower station is about three blocks north of the existing 7th/Metro Center stop that will serve all downtown Metro light rail lines once the Regional Connector is built. The Metro Board of Directors are scheduled to make a decision on the route and the stations at their Oct. 28 meeting, the same date they are also supposed to vote on an alignment for the subway. Decisions on both projects would trigger final environmental impact studies needed before construction could begin on either project. As with the subway project, the Board of Directors are not bound by staff recommendations. 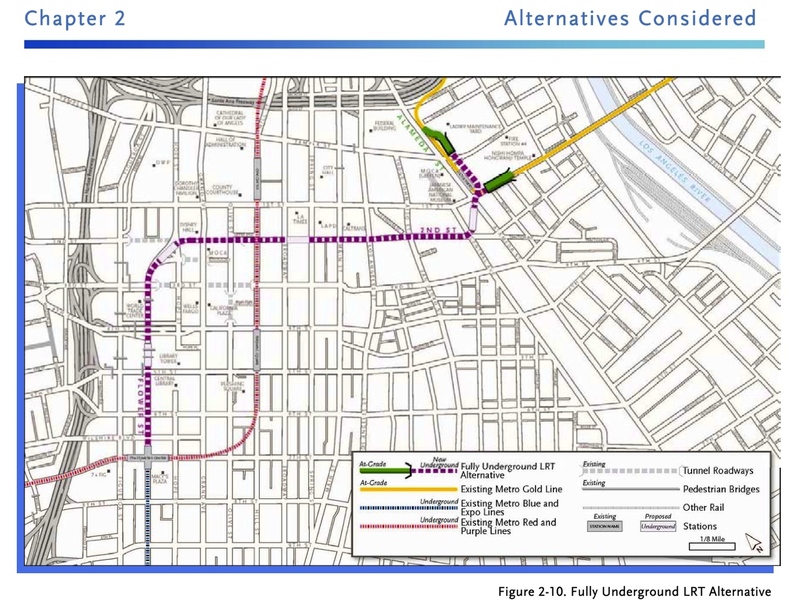 Other potential routes for the Regional Connector that were studied as part of the DEIS/R included a mostly surface route and one that was mostly underground. In essence, the problem with the 5th/Flower station was money. The fully underground option — added to appease concerns in Little Tokyo that a surface line would disrupt access to the community — is expected to cost $1.245 billion in 2009 dollars and more than $1.4 billion if completed by 2019, as proposed. Losing the 5th/Flower station lowers the cost of the project by about $100 million and also improve the ‘cost effectiveness’ rating of the project, an important measure the Federal Transit Administration uses to determine funding for projects. In other words, staff believes that a better cost effectiveness rating may lead to a higher federal contribution to the project — which will rely heavily on federal funding to get built. The Regional Connector is due to get $160 million from the Measure R sales tax increase approved by voters in 2008. As with the subway project, the public comment period remains open through Oct. 18 for the Regional Connector — here’s the online comment form. As posted earlier, those comments will be summarized for the Board of Directors and will be considered as part of the final environmental study for the project. I would guess that Metro plans to accomodate the larger crowds at 7th/Metro. Other major transit systems accomodate much larger crowds with larger gaps between stations. I think making 7th/Metro able to handle larger capacity would be significantly cheaper than building an extra station from scratch. Additionally, having two train stations within two blocks of each other seems like overkill (that’s three stations in a .3 mile stretch…). Plus, it would make the time waiting at train stations 20% faster. The staff recommendation to eliminate 5th/Flower station is a very big disappointment. This station is needed because 7th/Metro Center is going to be way too crowded. Also, the geography of the area (which includes Bunker Hill and City West) is not easy to walk. A station would have made commuting feasible for a lot of people. Now, many of these people will just stick with their cars. I realize why you did it (additional 10% match promised by the feds), but I still think it is a big mistake. I totally understand the staff recommendation, but I would urge the Metro Board to consider keeping the 5th/Flower station in the FEIS/R as an optional future station, with a provision to build a station box (as suggested by an earlier commenter) to allow construction when funding is available. Including the 5th/Flower Station in the FEIS/R phase would reduce the need and extent of additional environmental review if funding is found to close the $100 million gap to construct the station. The build-out of 5th/Flower Station could be financed through Transit-Oriented Development opportunities (similar to Embarcadero BART Station in San Francisco – see http://www.sfredevelopment.org/index.aspx?page=56 ) or a Transit Benefit assessment district. Maybe i’m missing something. Isn’t the blue line subway north of pico? Couldn’t the regional connector just be an extension of the blue line? It seems this way you don’t have to add a new line/color/name. Can someone help me understand this? Thanks. David: The Regional Connector is not a new line, but a tunnel to connect existing lines through Downtown L.A. In other words, this project will extend the Blue Line up through downtown to the Gold Line. You will be able to ride a single train from Long Beach to Pasadena without transferring. And once the Expo Line is completed, you will be able to ride a single train from Santa Monica to East L.A. without transferring. Joel: I find it hard to believe that having to walk a couple blocks south or a couple blocks north will make people not want to take the train. Two downtown blocks are very short. The station honestly just seems pointless in the first place. What area will be served by having the 5th and flower station that will not be served by either 7/Metro or the proposed station between 2nd and 3rd? People who are dissuaded because they have to walk an extra 0.1 miles are people who probably wouldn’t take Metro anyway. Agreed. Skip 5th & Flower, and let’s get on with it. As someone who’s lived in New York and London, while I would have preferred the 5th & Flower station, the distance is not an onerous walking distance. It is a disappointment not to have the 5th & Flower station, but not a deal breaker by any means. This project and the Purple Line extension will transform transportation in Los Angeles. Jared: The subway should be designed for everybody to use, including the disabled and elderly. 1/3 of a mile not seem like much to you, but it is for other people. Anyway the main issue is the capacity issue at 7th/Metro. When Expo opens, that station is going to be very crowded. At a minimum, Metro needs to open up another exit to 7th/Metro. I would agree that the walking distance between 7th/Metro Center and the 5th & Flower Station is very short. The only problem I see is that by 2035, additional ridership and population growth could make the 7th/Metro Center station very crowded, not only impacting passenger comfort but potentially creating a life/safety issue. Having a 5th/Flower station would provide additional capacity similar to the multiple closely-spaced stations along the Market St. BART/Muni Metro Subway in San Francisco. However, given the fiscal constraints of the program it looks like Metro staff are recommending the most prudent course of action in removing 5th/Flower from the project. I only hope that Metro will study long term passenger capacity needs at existing stations once the Measure R program build-out occurs.